Absolutely brilliant. 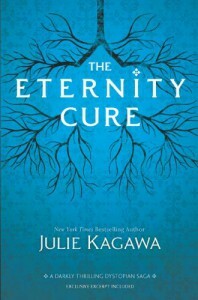 The Eternity Cure was one of my most anticipated books of 2013 and it was better than I thought it would be even with my very high expectations. I tend to shy away from most vampire books these days mainly because all of them are so similar. Whenever I pick up a new vampire book I feel like I've already read it. Blood of Eden is my all time favorite vampire series because it's so unique. Once I started this book it was almost impossible to put down. Not only is Kanin's life on the line, but now the entire human and vampire population are at stake. Sarren is still as psychotic as ever. Julie Kagawa knows how to write a villain. Sarren is insane with just the right amount of brilliance that makes him deadly and pretty creepy. The only thing creepier than Sarren were the bleeders. Even thinking about the bleeders is creeping me out. This book wasn't very fast paced but it really seemed to work for it. It allowed for the world to become more real. Information about the vampires that live in New Covington and how the Red Lung virus came to be is revealed. Kanin even talks about some of his past. What really makes this book amazing are the characters. Allison is still a badass vampire but in this book she really seems to struggle with what she wants to become. Should she give into the Hunger or try to hold on to her humanity? Jackal is probably one of my favorite characters now. Sure sometimes I wanted to stab him with a wooden stake but other times I was grateful for his sense of humor. The Eternity Cure would have been much darker without it. Another thing I loved was Allie and Zeke's relationship. Zeke is still as sweet as ever. Even though Allie kept pushing him away because she thought she was a danger to him, Zeke never gave up. When Allie left Zeke in Eden I thought that he wouldn't play a big part in this book but thankfully I was wrong. The ending of this was torture. I still can't believe what happened even though I kind of guessed what would happen while Sarren was talking. I'm surprised I caught on to what was happening because it was only one word that caused me to guess the end. The next book can't come soon enough.